Arctic/Shell article + “Chasing the Ice”. | No place like home. Here’s an incredible trailer for a new doco, “Chasing the Ice”, detailing a massive “calving event”. Then have a look at how Royal Dutch Shell is contributing perhaps, more than anyone else, to ensuring an ice free industrial zone at the top of the planet. An oil rig collapsing and other “too bad to think of” Arctic events that could turn a white wilderness into a black environmental hole came closer yesterday when a drilling ship, the ‘Kulluk’, owned by SHELL, drifted in stormy weather before being driven on to rocks on Kodiak Island. Royal Dutch Shell have been ‘gung ho’ to get their teeth stuck into some cold icy water since last summers “Big Arctic Melt” saw the “VOLUMN” of arctic summer ice fall to 25% of the level in the 1980’s. Ice free Arctic summers are now forecast by a growing number of scientists as alarming new reports about increasing Methane levels from the Arctic seas . 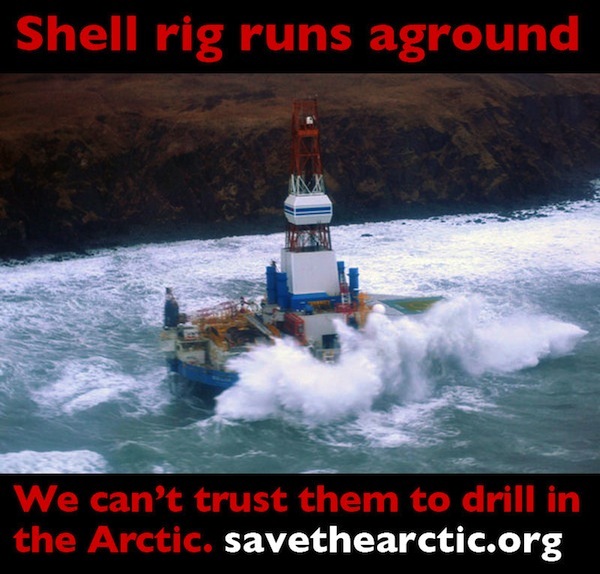 Undaunted, Royal Dutch Shell continue throwing billions at the possibility of destroying the Arctic. The now grounded Kulluk had completed preliminary drilling and was returning to ice free waters when it ran aground. It had hoped to accomplish much more this (2012) Arctic summer, HOWEVER a second drill ship, the Discoverer, was briefly detained in December by the coastguard in Seward, Alaska, because of safety concerns. A mandatory oil-containment barge, the Arctic Challenger, failed for months to meet coastguard requirements for seaworthiness and a ship mishap resulted in damage to a critical piece of equipment intended to cap a blown well. HELP STOP THE INDUSTRIALISATION OF THE ARCTIC WILDERNESS – Go to the Greenpeace website now and leave your support. This entry was posted in Environment, Home, Solutions and tagged a disaster waiting to happen, Greenpeace arctic campaign, Kulluk runs aground, Save the Arctic, Shell arctic drilling by ixpieth. Bookmark the permalink.